Become Career » What Does a Paralegal Do? Have you ever wondered what a paralegal does? These support professionals work can do anything their supervising attorney allows them to do, so no two paralegal jobs are exactly the same. However, most paralegals work on similar tasks, including assisting attorneys in court, working directly with clients, reviewing paperwork and performing clerical tasks. Paralegals aren’t able to stand in front of a judge and make legal arguments on behalf of a client, but they are still a valuable presence in the courtroom. 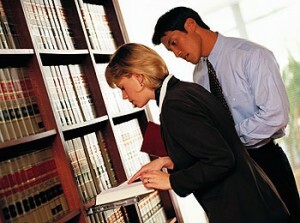 Paralegals often accompany attorneys to court, take notes on proceedings and offer strategic advice. By providing support services, good paralegals allow their attorney partners to focus on the big picture in a case. A shrewd paralegal can even provide the key details to winning a difficult case , like the paralegal whose careful investigation of legal documents uncovered fraud in a 4.25 million case, according to ABA Journal. Paralegals are also given reconnaissance duties like attending a case to observe the lead attorney’s style or learn more about a judge’s disposition. A paralegal cannot practice law on their own, but they can help clients with many different needs. An attorney might ask a competent paralegal to draft a will, create a contract for a small business or prepare a witness for interview. After several years of work experience, a paralegal may be trusted to work independently on some client cases with minimal review from their supervising attorney. In some states, paralegals can even draft contracts on their own, and some paralegals build a career on working directly for clients. In small offices, the paralegal may be the only employee a client sees, so paralegals need to be professional. Although paralegals can help attorneys with legal appearances and client interviews, the most important duty of paralegals is to keep their offices running smoothly. Meticulous organizational skills are necessary to succeed in this career. Paralegals must keep track of upcoming deadlines, file paperwork correctly and ensure that all legal documents are formatted properly. Often, an attorney will write a contract or brief and hand it to the paralegal for a final check of the grammar and case citations in the document. In small law offices, a paralegal’s job duties will include greeting clients, scheduling appointments and collecting payment. Paralegals may also be expected to possess technical skills in Microsoft Office, online research and in-house software systems. In particular, older attorneys may completely rely on paralegals for assistance with computer use. In previous years, attorneys would hire smart, organized employees with no formal education and train them to be strong paralegals. Today, a degree in paralegal studies is a virtual prerequisite to begin a career in this field. Attorneys want paralegals who will be competent from their first day of employment, so an associate’s in paralegal studies is often needed for an entry-level position. A bachelor’s in paralegal studies will lead to higher pay and more opportunities for advancement. Without a good paralegal, an attorney’s legal practice will not be successful. In a way, it’s easy to know what a paralegal does: Anything their supervising attorney needs.